Peirce Connections is the official blog of Peirce College, the college for adult learners with on-campus and online programs in Philadelphia. Countdown to 2011 Commencement has begun! 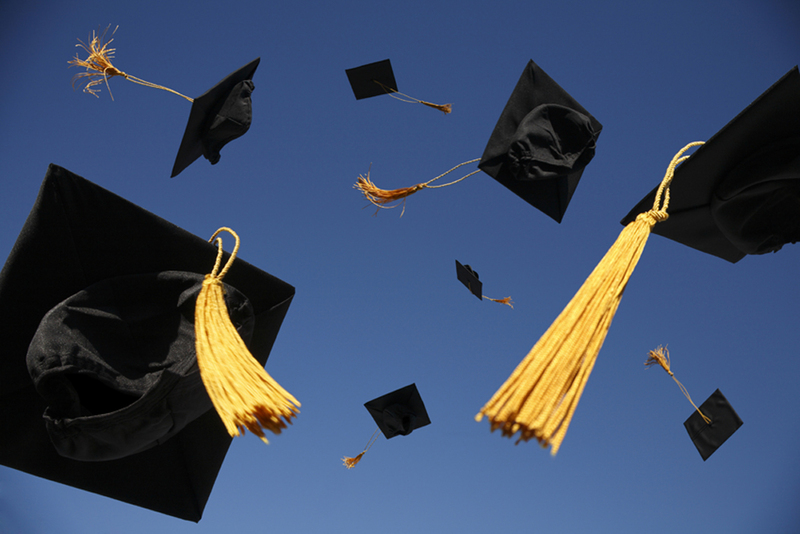 On Monday, June 13, we’ll be returning to The Kimmel Center for a celebration of this year’s graduates. Here are some highlights and things to remember as you prepare to become a Peirce College alumnus in the coming weeks. Soundtrack to Commencement: Peirce students have chosen “Ain’t No Stoppin’ Us Now” by McFadden and Whitehead to be the closing song at Commencement 2011. Peirce Idol: To continue the tradition we started in 2010, auditions are complete with a video in production that we’ll use to once again select the student who will lead us in singing our national anthem at Commencement. Be sure to check back in the coming weeks to watch the auditions and vote for your favorite! This year’s winner will be announced mid-May. Speakers: The Commencement Committee is pleased to announce that Shandai Moore-Jenkins has been selected as the Student Commencement Speaker for this year’s ceremony. Shandai is graduating with her Bachelors of Science in Business Administration with a concentration in Management. Charisse Lillie, Vice President of Community Investment with the Comcast Corporation and Executive Vice President of the Comcast Foundation, will deliver the keynote address. Just last week, she stopped by for a visit — watch the video below to see what she has to say about her upcoming speech! Caps and Gowns: Caps and gowns are on sale now through May 20. The graduating class can purchase them through the Peirce College Web portal under the My Classes tab, or in the Business Office during Business Office Hours. * The cost for cap, gown, tassel, and hood is $40. If you decide to order online, keep in mind there is an $11 shipping and handling fee. 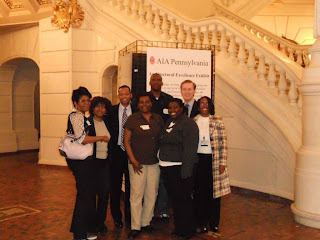 A group of Peirce students and administrators headed to the Pennsylvania State Capitol on April 12 for Student Lobby Day, held by the Association of Independent Colleges and Universities of Pennsylvania (AICUP). It was an opportunity to discuss issues that affect the many thousands of students who attend private institutions for higher education. The group (pictured below) met with legislators and explained how state-funded financial aid made it possible for them to attend Peirce and earn their degree. The goal was to prevent any further budget cuts to the PHEAA Grant Program. The Peirce students and administrators who attended were excited to have the chance to make their voices heard. And while the Student Lobby Day was important for political reasons, it was also a once-in-a-lifetime educational experience. Thank you to everyone who made it possible for Peirce to be there! Last week I had the honor of representing Peirce at a special signing event that reaffirmed the College’s Dual Admissions agreement with the Community College of Philadelphia (CCP). This was also the same day that CCP officially opened its newly renovated, environmentally friendly Northeast Regional Center. The Dual Admissions program helps students seamlessly transfer to a bachelor’s degree program at one of the participating colleges and universities. At the event, two new partners joined the nine existing partner institutions in our commitment to putting students on the path to a bachelor’s degree. Of the 11 institutions represented, Peirce was recognized as having the third longest-standing Dual Admissions relationship with CCP, dating back to 2000. Throughout the past 11 years, Peirce and CCP have worked together very effectively to transform the lives of students who have earned associate and bachelor’s degrees by attending both institutions. Giving students the option of taking coursework at both colleges enhances access to education and promotes higher degree attainment rates -- two missions that Peirce has always stood behind. The Peirce community has the utmost respect for CCP and the work of its faculty, staff, and administration. The partnership of our institutions will continue to yield great opportunity for working adults and traditional-aged students in the Philadelphia area. We recently accompanied Peirce President James J. Mergiotti on a visit to the Science Leadership Academy (SLA) in Philadelphia to meet with students participating in the Startup Corps program. We sat down with the students to hear about their entrepreneurial concepts and the projects they’ve been working on as part of the course. Peirce College is a founding sponsor of Startup Corps, serving as the educational sponsor to the group of 14 students who are currently part of the SLA entrepreneur group. The organization is built upon the principle of leveraging students’ passions and teaching them how to turn ideas into something tangible, all the while fostering an entrepreneurial spirit and encouraging them to be active, engaged participants in their own education -- all concepts that are very important to us here at Peirce. Startup Corps engages the regional entrepreneurial community to take part in the educational process, and volunteers play an important role in making the program a reality. Volunteer entrepreneurs can assist in many ways, including guest speaking, serving as mentors, or simply offering advice. According to Startup Corps co-founders Rich Sedmak and Christian Kunkel, SLA student businesses are making great progress across the board. One standout group is Phresh Philadelphia, a group of students who have formed a community organization to clean up neighborhoods and change Philadelphia’s reputation for being an unattractive city. They've been working with other local organizations such as the Philadelphia Youth Network and 100 Black Men to help build their volunteer base. Now in its second year, Startup Corps is currently offered in five locations across the city and has reached over 70 students. To support the growing number of program participants and mentors, Startup Corps relies not only on their volunteers but on partnerships and resources that are vital to meeting the demand of students and administrators throughout Philadelphia. In its role as founding sponsor, Peirce has “adopted” the SLA chapter and provides both financial support and mentoring. Last spring, Peirce’s Students in Free Enterprise (SIFE) group worked with the Startup Corps students at SLA, serving as mentors to provide feedback on their business plans and help them develop their entrepreneurial skills. Over the next two weeks, our current group will be matched up with their SIFE mentors from Peirce. They’ll soon meet face to face and start this year’s mentorship process to begin preparing for their final presentations! Peirce and Startup Corps continue to build their relationship upon a shared commitment to educating Philadelphians, no matter what age. Peirce is proud to work with an organization like Startup Corps that shares our commitment to educating Philadelphians while supporting entrepreneurship, something the College sees as integral to the future success of Philadelphia’s economy. And of course there are the talented young students who inspire us every day with their personal dedication to their own education. We look forward to following their successes as they move forward with their business plans and prepare to graduate from the program! Watch the video to learn more about the Startup Corps mission and how Peirce College fits in to support the program. Career Development Services hosted its second annual job search panel on March 24, "How to Land the Job: A Panel Discussion with Area Employers." Dawn Bruno, Director of Employee Relations from McCormick Taylor, Inc.
Time to find the voice of Peirce College Commencement 2011: Auditions open! We recently hinted at the upcoming call for auditions, and now it’s official. We’re looking to you, Peirce students, to share your vocal talents for Peirce Idol 2011! On Wednesday, April 27 and Thursday, April 28, Peirce College will audition students to sing the national anthem at Commencement on Monday, June 13. If you love to sing and are interested in sharing your talent on stage among graduating students and their families, e-mail us with your name and phone number. A member of the Peirce Idol search team will contact you to schedule an audition date and time. Auditions will be held on campus before a panel of judges composed of Peirce faculty and staff. Please note that tryouts will be video recorded so that your peers can decide who they want to be Peirce Idol of Commencement 2011. Voting will take place here on Peirce Connections with the winning student announced mid-May. Reserve your spot now and contact us by Wednesday, April 20 for your chance to compete! One of the largest and most common obstacles that confronts aspiring students is finding the way to pay for their education. The good news is there are many resources available to help students make college more affordable, and experts who are happy to help identify and navigate the often complex world of financial aid. In January 2011, Mayor Michael Nutter launched a citywide Financial Aid Campaign to increase the number of Philadelphia students who are financially prepared for college. To help make sense of the many sources of financial aid available, FOX 29 teamed up with the Philadelphia Mayor’s Office of Education to present a Free Money Financial Aid Phone Bank on "Good Day Philadelphia" earlier this week. Staffed with financial aid experts and counselors from a number of area colleges, including our very own Lisa Gargiulo representing the Peirce Financial Aid Office, the team answered questions about financial aid and walked callers through the process of filling out the Free Application for Federal Student Aid (FAFSA). Mayor Nutter talked to FOX 29 about the importance of financial aid and how his Office of Education is committed to helping more Philadelphia students earn a college degree. FOX 29 reporter Kerry Barrett also spoke with Peirce student Nakia Stokes about the role financial aid has played in helping her to achieve her dreams of a college degree. With plans to graduate from Peirce this summer with a degree in Business Administration and a concentration in Human Resource Management, Nakia credits financial aid and the ongoing support from Peirce in helping her find the tools and resources to make education affordable for her. Watch the interview below. With over 80 percent of Peirce students receiving some sort of financial aid, including grants, scholarships, and tuition discounts, we truly understand the importance of financial aid in making higher education accessible, particularly to working adult students. The mayor’s office has big education goals for the city, such as cutting the dropout rate in half and doubling the college attainment rates to create a highly educated workforce in Philadelphia. Dr. Lori Shorr, Chief Education Officer at the mayor’s office, shared additional details about their PhillyGoes2College (PG2C) office and what they are doing to encourage Philadelphians to pursue higher education and earn their college degree. She reiterated that financial aid is a key part in making education possible for many aspiring students. Peirce College supports a wide variety of educational initiatives in Philadelphia, including PG2C, the City of Philadelphia Scholarship Program, and the Mayor’s Returning to Learning Tuition Discount Program. We share the mayor’s commitment to educating Philadelphians and are proud to support every effort that focuses on the importance of education. Even if you missed the phone bank, visit PhillyGoes2College online or call the Mayor’s Office of Education any time at 215-686-0315 for ongoing information and support regarding financial aid. You probably saw my recent post where I shared the rules for how men and women should dress for interviews and a day at the office. They were all tips that Peirce students learned at the Career Development Services fashion show, where students and staff walked the runway to modeling the best and worst ways to present yourself in a professional setting. But if you're more of a visual learner, you'll want to check out the video of the event! See what outfits made the cut and why, what looks to avoid, and what Peirce alumni have to say about professional style. What's your go-to interview outfit? We shared some exciting news for the Peirce Paralegal Studies program a few months back: the College established its own Chapter of Lambda Epsilon Chi (LEX), a nationally recognized academic honor society for paralegal students sponsored by the American Association for Paralegal Education (AAfPE). LEX provides a platform for established Paralegal Studies programs to recognize students for their academic excellence. We have so many outstanding students here at Peirce that it was a logical step to find a way to recognize their achievements. 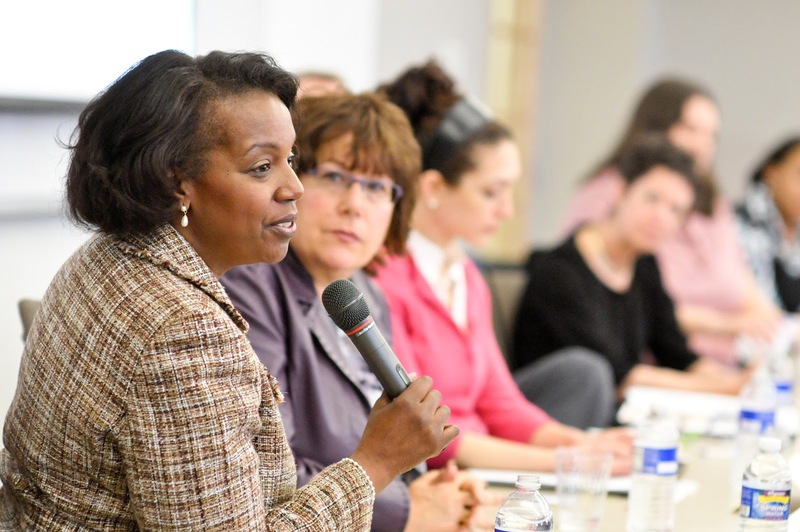 Since then, Assistant Professor Cyndi Gentile, Associate Professor Carol Sherman, and Dean of Students Rita Toliver-Roberts have been hard at work to make this happen. On Friday, April 15, 2011, we will be inducting our first class of members into the Peirce chapter of LEX. This inaugural group of 73 inductees includes current students as well as alumni who have graduated within the past five years, all of whom have met the society’s standards for superior academic performance. To be eligible for LEX, inductees must have a cumulative and major GPA of 3.5 or higher within the Paralegal Studies Bachelor of Science degree program or the Post-Bachelor Certificate program. May 2 is the final day to submit your applications for the annual Mayor's City of Philadelphia Scholarship Program. 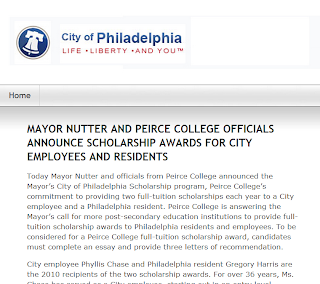 Peirce supports this program by awarding two scholarships a year to City of Philadelphia employees or residents that covers full tuition and fees. So be sure to print out a copy of the application and get to work filling it out! This is the second year of the Mayor's Scholarship Program, which is one of the City's many programs to help Philadelphians further their education. 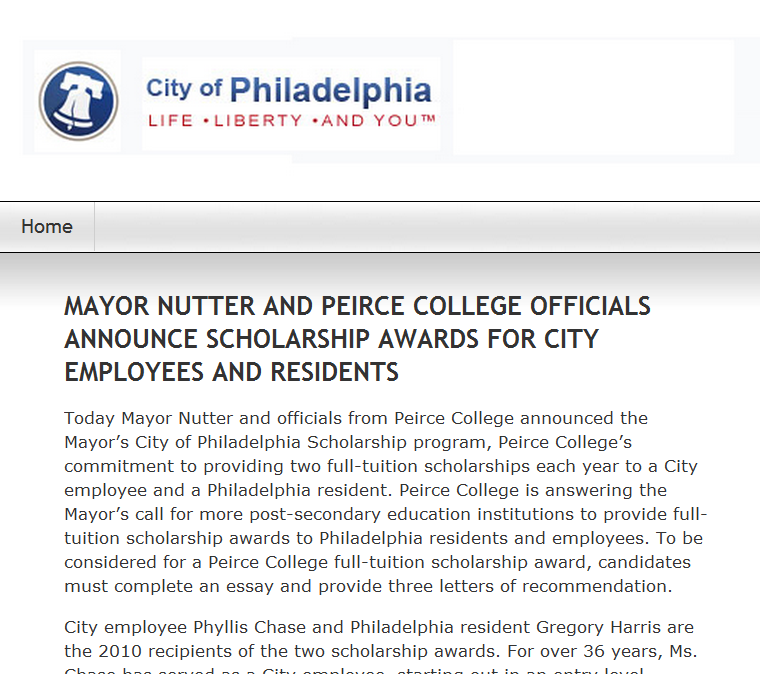 Peirce also support's Mayor Nutter’s PhillyGoes2College initiative and Graduate! Philadelphia, a joint venture of the Philadelphia Workforce Investment Board and the United Way of Southeastern Pennsylvania. While the benefits and opportunities that come from earning your college degree are invaluable, paying for that education can often be overwhelming, and for some students, inconceivable. On March 22, Peirce College held a special Scholarship Reception to celebrate our students who have received scholarship support and recognize those who have contributed to our scholarship programs. It’s important for our donors to see the impact their contributions have on our students. It’s also important to recognize the students who have received the scholarships and their commitment to their education. For that reason, we invited two student scholarship recipients to step to the podium and share their personal stories about the impact that their scholarships have had on their educational journeys. Peirce College is a private, four-year, specialized institution providing practical, high-quality degree programs to primarily working adult learners. Questions? Chat Live with Us!